My morning routine is always the same. Alarm goes off, stumble out of bed, go to the bathroom, shuffle into the kitchen, make coffee (thankfully my Keurig makes it instantly), get back into bed, drink my coffee, turn on the local morning news program, and check email and Facebook. My Sweetheart brings me breakfast in bed before I start the crazed morning rush to get ready for work. Every day it’s the same old thing. BUT, one morning, I was knocked off my rocker by a post on Facebook by my father. It blew me away and sent me on a tailspin I had not been on since my struggle with depression in the early 1990s. How could one little post have such an impact on me when I had supposedly healed from the devastation he had inflicted on me as a child? I couldn’t put my finger on it, but something about this post made my stomach queasy. Every day, I would look to see if anything new was posted and researched to see just who this mystery girl was. My father lives out of state, and we only stay in touch electronically, so I had no idea what was going on in his life. For whatever reason, I became obsessed with finding out why I had such a creepy feeling about this situation. A few days later, the truth unfolded. Her stepmother commented on his post about the girl being only fifteen, which meant she was fourteen when they met. My father was seventy-seven years old at the time. What I had to deal with is the knowledge that my father was continuing to be fond of under-aged teenagers. Yes, I had known he almost always had a “lady friend” over the years, even my sister’s best friend and other young women who lacked a stable family background and/or had addiction problems. Although it was disgraceful, those were all at least legal adults. I had a huge dilemma now that I was aware his ways had not changed since I was one of his victims. What in the world was I going to do about it? Let’s go back to the year 1971, when I finally told my mother about being sexually abused for years by my father whenever we visited him. It’s something I really don’t understand…why I waited so long to tell her. Dad never told me not to tell anyone. He just let me do things while I was visiting him that I knew would disappoint my mother. That’s how many predators work. Getting children to do something they think they would get in trouble for doing, so it sets them up to keep secrets from their protectors. The abhorrent thing about my circumstance was that my father was supposed to give provision and protection for his little girl, not take advantage of her. Rather than having me face a trial and testify against my own father, my stepfather adopted all of us and my father signed away his parental rights. It put a stop to the abuse and protected my younger sister and brother from harm. Back to the question posed earlier, what could I do to stop others from being hurt by my father? After much prayer and consultation with my husband, our pastor, and my mother, I realized there was nothing I could do to keep him from preying on young teens except pray. I had to deal with my feelings of abandonment and neglect, especially when I found on Facebook he had traveled out of town to buy this girl and her sister school supplies and clothes the previous fall. Why was that so hurtful? Why had he never done that for his own children? Why were his words about how much he loved this girl and would wait for her to be old enough to make her own decisions like a knife piercing my heart? Working through the pain of his selfish choices to always put his desires above our needs took some more letting go. More rejection calls for more forgiving, as well as more allowing the God of All Comfort to soothe my freshly re-opened wounds. Healing is a process. Would it ever end? 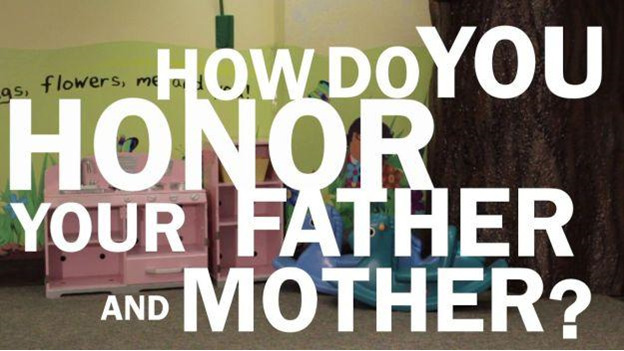 Honor your father and your mother is the fifth commandment. No problem honoring my mother, as she has always done her best to take care of her children, despite some very difficult circumstances. I have forgiven my father, many, many times, but I do not have an active relationship with him because I choose not to be part of his web of deception. I pray for my father and send him emails that might help him see his need to turn his life over to God. He responds kindly. Honor him? Father’s Day is one of the most difficult days of the year for me. Just reading those cards, trying to find one that might work and die a little inside to see what wonderful things other people, even my children, can say about their fathers. But honoring my father can be in the way that I live my life. It can be honoring to a father who dishonors his children when we walk in truth, in a personal relationship with Jesus, extending love, grace, and forgiveness that only can come as a result of the Holy Spirit living in us. Boy, would I love to wrap this all up in some shiny silver paper with a beautiful blue bow on top for you, but that’s not gonna happen. This is incredibly tough, I’m not going to sugar coat it and say everything ended up happily ever after. It’s kind of like the dialogue from the movie Shrek when Shrek tells Donkey that we are like onions, made up of lots of layers. My hurts and your hurts over a lifetime have created layers of scar tissue that cannot be dealt with all at once. What happened that morning was a peeling back of one more layer of painful memories exposed in order to be healed. When that happens, I can be angry and bitter or choose to obey God and forgive and leave the results to Him. That’s what honors my Heavenly Father. And the Father of the Fatherless will honor those who honor Him.